2nd Place in the 42nd Annual Tri-County Show. 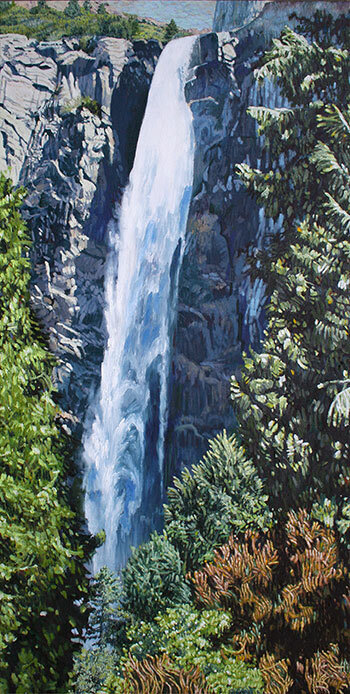 This point of view of Bridalveil Falls, was captured during a family outing. My brother, Michael, was up for a visit with his clan and we decided to take everyone up to the park. We trekked up the wet, slippery, switchback trail, running alongside the falls, to its end, to capture this view at the top. Up here above the treetops, viewed through the damp mist, revealing a green meadow-crown populated by even more conifers stretching back into the distance (a vista that most rarely see), all was primordial. The realization came to me: this scene was playing out long before we arrived and with any luck, would be carrying on long after we're gone.